There is consensus that extreme poverty and hunger must be eradicated by 2030 through accelerated, inclusive and equitable economic growth without damaging the environment. This calls for sustainable and integrated, balanced and simultaneous implementation of economic, social and environmental dimensions without one dimension gaining at the expense of others, as agreed at the Rio+20 Conference and confirmed at the 68th session of the United Nations General Assembly, when world leaders met in New York City in September 2013. This paradigm shift from economic growth and per capita income as a measure of development, and relying on a single-sector approach and trickle down mechanism, to an integrated, inclusive, equitable and labor-intensive multi-sector development agenda post-2015 will require a major shift in political will and in ways of doing business. In agrarian societies where the majority of people live in extreme poverty and unemployment or under-employment, the acceleration of traditional methods of economic growth to create jobs and end hunger and poverty will mean enhancing agricultural methods of de-vegetating land and damaging the environment through biodiversity loss, soil erosion, dropping water tables, shrinking water bodies and adverse impact on thermal and hydrological regimes, resulting in intense and frequent droughts and floods. On the other hand, introducing or speeding up intensive and mechanized agricultural methods using green revolution technologies of high-yielding seeds that require the application of high doses of fertilizers, pesticides and irrigation, including using underground salty water, will end up damaging the environment and reducing water supplies. This has already happened in some Asian countries. In developed countries, continued or an acceleration of current patterns of consumption of meat and dairy products that rely on huge amounts of agricultural feed, and result in massive food waste, as well as increasing demand for non-food agricultural products like cut flowers, will mean that more land will be brought under cultivation by clearing vegetation or replacing food production in areas already under cultivation, as has happened in Uganda. Alternatively, more fertilizers, pesticides and irrigation will be used to increase land productivity, resulting in environmental pollution. To overcome these trade-offs and successfully address unemployment, hunger and poverty, a new approach to production and consumption patterns is needed. The new approach should end food losses and waste, and apply labor-intensive methods rather than labor-saving machines. It should use a combination of organic and inorganic fertilizers and pesticides to boost productivity without damaging the environment. In developing countries, much food, especially perishable produce like fruits and vegetables, is lost through pre-and post-harvest leakage. Controlling food-destroying birds, insects and wild animals before crop harvest and improving storage, including cold facilities and agro-processing after harvest, would go a long way in reducing food losses, thereby making more food available without applying environmentally destructive extensive or intensive agricultural methods. Degraded lands would be restored through labor-intensive re-forestation programs that would create jobs and raise incomes to pull people out of intergenerational extreme hunger and poverty. Experiments by smallholder farmers in some African countries have shown that labor-intensive, environmentally and socially-friendly technologies such as crop rotation, terracing and contour farming, as in the Machakos district of Kenya, mixed cropping and mixed farming of crops and animals, zero grazing, small-scale irrigation and water harvesting schemes and fertilizer trees have boosted agricultural productivity and food availability and affordability, reducing hunger and poverty without damaging the environment. Thus changing production methods, including mechanized agriculture, that are environmentally and socially-unfriendly and eliminating pre-and post-harvest food losses in developing countries and consumption patterns in developed countries, including massive food waste, would go a long way in creating needed jobs and making more food available and affordable, ending hunger and extreme poverty by 2030 without damaging the environment. However, this success will require changing political mind sets and ending business as usual in production and consumption patterns in the post-2015 development agenda. Historically speaking, wealthier, developed nations, particularly the US and Europe, have led the world on renewable energy, investing the most capital and building the most capacity. Last year, that changed. In 2015, for the first time, countries outside the Organization for Economic Cooperation and Development (OECD) invested more in renewable energy and added more renewable capacity than the 15 OECD countries combined. This is only a bit of symbolism — the lines have been converging for a while — but it is important symbolism. The finding comes from the 2016 Climatescope report from Bloomberg New Energy Finance (BNEF). 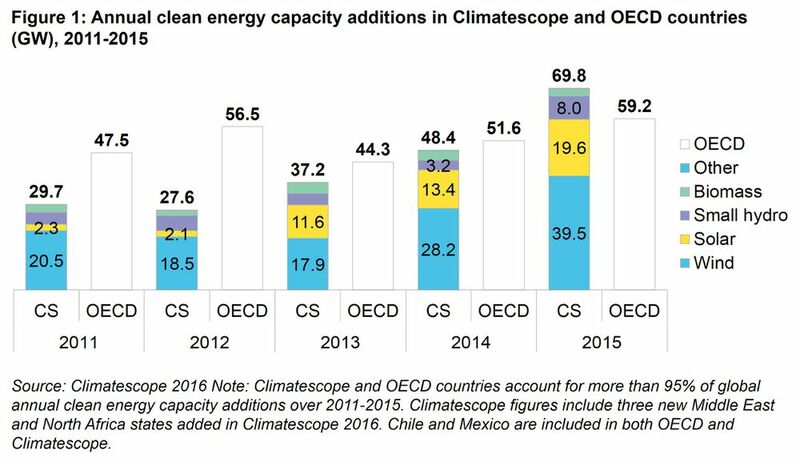 It’s an annual snapshot of the state of clean energy in non-OECD countries. It goes deep, ranking countries on policies, finance, value chains, and various other metrics. They’ve got an excellent data visualization to walk you through the results, if you’re interested, and a cool widget that allows you to compare any two countries on any set of metrics. As you can see, after some fluctuations, non-OECD countries nosed ahead last year. It might bump around another year or two, but the longer term trend is clear: The center of clean-energy gravity is moving south. 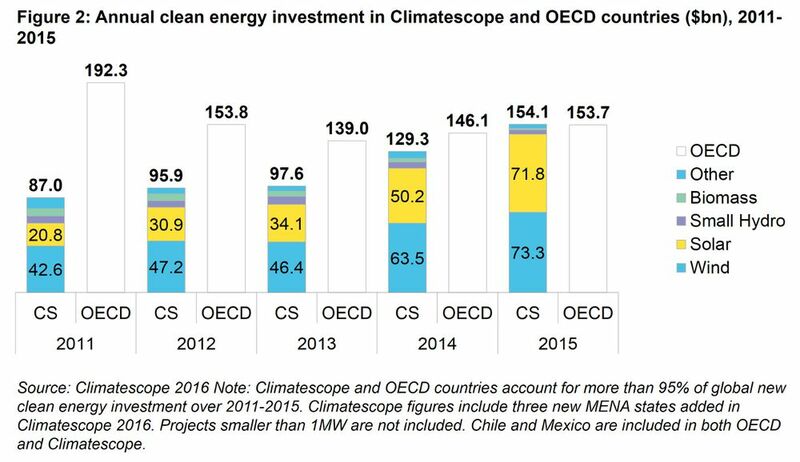 Again, these numbers might bump around for a few years, but renewable-energy investment in non-OECD countries is headed up, whereas investment in developed nations seems to have plateaued. Investment in utility-scale solar in Climatescope nations spiked 43% from 2014 to $71.8bn in 2015. Total clean energy investment in Climatescope countries rose $24.8bn with solar accounting for nearly all of that. Photovoltaic (PV) costs are essentially on par with wind and, as recent tenders for power contracts have demonstrated, PV can now out-compete fossil-fuelled projects on price. An expanded list of emerging countries committed billions to clean energy last year with record increases, including Mexico ($4.2bn, up 114%), Chile ($3.5bn, up 157%), South Africa ($4.5bn, up 329%) and Morocco ($2bn, up from almost zero in 2014). The world’s fate will now be decided by the race between coal and renewable energy in the Southern Hemisphere. Coal growth is slowing, but we are still headed for catastrophe. If this unfolds, global average temperatures will exceed 2 degrees — possibly even 3 or 4. 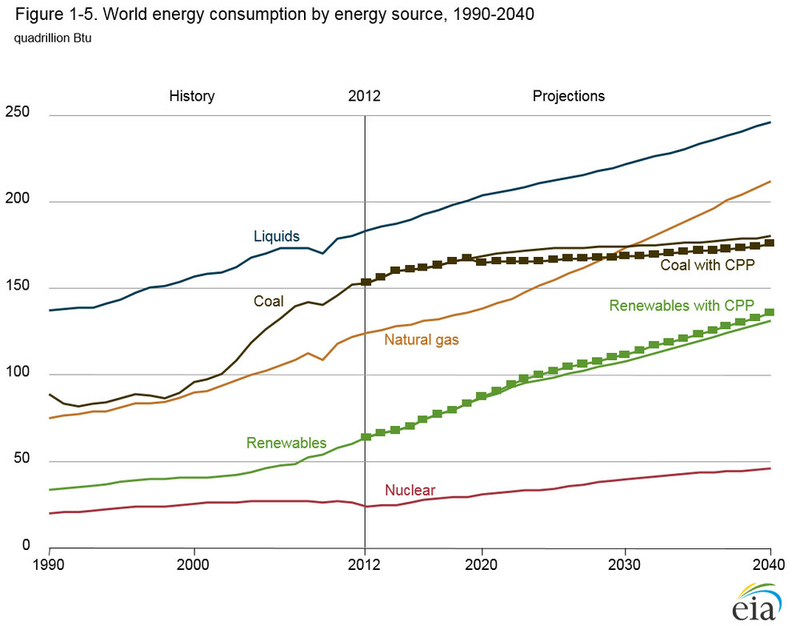 To stop short of 2 degrees, global coal use will need to be close to zero by 2040, with oil not far behind. Emerging nations, like their OECD counterparts, are moving in the right direction, but too slowly.